The Resident Evil series has gone through a few changes throughout it's 15 year reign. Starting off as a straight-forward survival horror which combined puzzle elements, the series took a slight diversion upon the release of the excellent Resident Evil 4. The game successfully managed to refresh the series with more action, but still managed to retain most of the creepy horror that fans had been used to in the entries before this. However, this all changed with Resident Evil 5, which seemed to leave behind the aspect of the original titles which won fans in the first place-the survival horror element. More action and faster paced gameplay took its place, which worked exceptionally well in this worthy addition to the series, but many fans were left yearning for a title that returned the series to its roots. Yes, change is a good thing, especially in a series that has the potential to be seen as quite stale after all these years, but at the same time, there's nothing better than relishing in old memories. This is where Resident Evil Revelations comes in. Released in January 2012 for the Nintendo 3DS, Revelations marks the second title for Nintendo's latest handheld system. However, unlike Resident Evil Mercenaries 3D, Revelations is not just a longer version of the series bonus mercenaries’ mode, it's a full blown story. 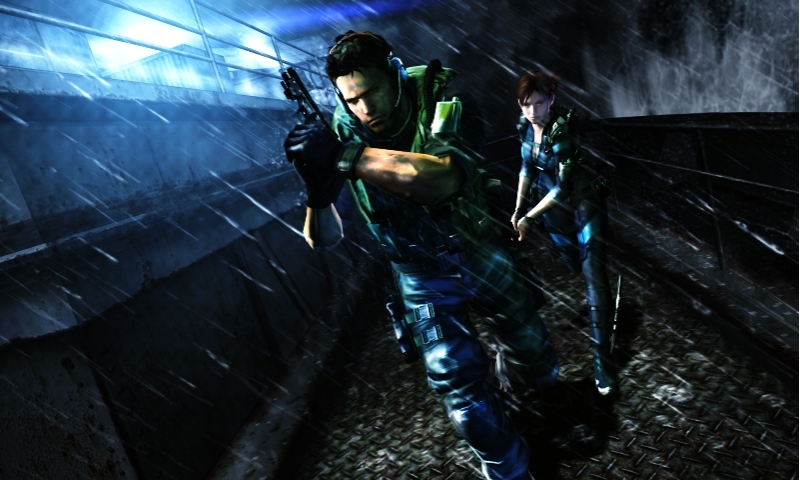 Fitting in between the events of Resident Evil 4 and 5, Revelations sees series regular Jill Valentine and her new partner Parker investigating some mysterious goings on aboard a supposedly abandoned cruise liner, the Queen Zenobia. At the same time, her long-time friend and partner Chris Redfield is desperately trying to track Jill down, with the help from scantily-clad agent Jessica Sherowatt. Most of the action takes place aboard the Queen Zenobia, which is a perfect setting for the tension and horror that the game promises from the start. Like the mansion in Resident Evil 1, the Queen Zenobia has an abundance of twisting, dark and claustrophobic corridors. It’s easy to become paranoid that something is lurking in the darkness, just waiting to take you by surprise. The paranoia is justified though, as there are plenty of these moments in Revelations, and you’ll jump on several occasions throughout the story. Aesthetically, Revelations is definitely the best looking 3DS game to date. The characters look great, the cinematic cut scenes are incredibly impressive on such a small screen, and the environments have been well designed. There are plenty of details, such as a variety of lighting, rust and grime which all help to add to the uneasiness that is quickly felt when you cautiously guide Ms. Valentine and co through the winding corridors. Capcom have really done themselves proud in terms of the graphics, and it is hard to imagine that anything will best them on the 3DS for a while. We shall see though. Another area that Capcom have achieved in is the sound. The game uses the Nintendo 3DS’ surround sound capabilities to the maximum. The orchestral sounding score really helps to heighten the action sequences of the game, but it is the sound effects that greatly emphasise the horror, and this is where the high level of detail is really picked up on. Everything sound has been accounted for, from the slithering, shambling footsteps of the enemies, wind howling menacingly or even, in trademark Resident Evil fashion, the ‘lovely’ sound of blood dripping. Playing Revelations with headphones in is where the real horror comes in, as the surround sound, and these atmospheric sound effects really immerse the player in the scares. Those completionists out there will relish in how much content is packed into Revelations cartridge. Players have the option to use their scanner to pick up any hidden items, discover secrets, and unlock new characters, costumes and weapons. In Revelations, Capcom has steered clear of the zombies from the older entries in favour of the Ooze, a Regenerator-type creature which has the ability to enter from any opening. This of course heightens the uneasiness, as players will have no idea where they will pop up next. Hallways that you have traversed and cleared of these infected beings may appear to be empty, but are they really? This is where Revelations really harks back to the older days of the Resident Evil series, as the fear of uncertainty is constantly harrowing you. Revelations quickly fits in with the horror aspects of the series. There’s plenty of blood filling the environment, enemies are at times incredibly horrific (look out for Rachel, you’ll end up dreading her appearing once again as the game progresses), innocent people die terrible deaths, and the settings, especially the Queen Zenobia, leave little room for an easy escape. Like the titles before it, Revelations thrives on the unexpected first encounters, and the realisation that a hard confrontation with an antagonist is always close by. The boss battles are also well thought out, and the story fits in well with the rest of the Resident Evil timeline. In terms of the controls, the game is much better to handle when using the Circle Pad Pro add-on which simply clips on to the 3DS. It may look rather bulky, but it’s rather comfortable to use, and enhances the gameplay, which is a little fiddly at times when used normally. Capcom avoids the co-op play that Resident Evil 5 introduced, and instead includes an AI partner (Parker) who will help you to shoot down enemies when the situation is getting a little sticky. Thankfully, unlike Resident Evil 5’s Sheva, Parker will not want to heal you constantly, and does not drain your resources. In fact, you are left to your own devices for the most part. As well as the main story, Revelations comes packaged with Raid mode, where players are able to work through a series of short missions to increase rank, unlock new weaponry and upgrades, new characters, and much more. In the absence of a mercenary’s mode, the Raid mode fills the hole perfectly, and makes a break from some of the longer levels and tough boss battles. Another welcome addition is play coins, which can be unlocked by using the Nintendo 3DS’ pedometer. Play coins can be exchanged for unlocks, so it works as a good incentive for keeping on the move. Resident Evil Revelations is a fantastic 3DS title, and also a worthy addition to the Resident Evil series. It pushes the boundaries of the 3DS console with fantastic graphics and high quality sound. It’s also nice to see a return to the spirit of the original games, which Resident Evil 4, but 5 in particular stray away from somewhat. It’s fantastic to see that the series works just as well in portable form, and fans should not be deterred by this. It’s just as good, even better might I add, than the console versions. It is by far the best game available on the Nintendo 3DS so far, and survival horror fans will love that there are plenty of opportunities to get scared within. Like any RE game, this could be a good game or a flop. Not going to lie, the series is starting to lose its flavor(if it hasn't already). I've been a long-time fan of the RE series, so I'm a hard one to disappoint. This however, Revelations, was perhaps one of the best yet. It just seemed to fit right in with the older games again.